Europe's continental union is probably most famous to outsiders for its euro currency and Schengen free travel area. But it's actually much more than that. After all, the UK is preparing to leave the EU, but it's not even in the Schengen Area or euro currency zone anyway! What unites the countries of the European Union is a set of laws that all members are required to share. Mostly these are laws about things like the economy, trade, natural resources, and immigration (a major sticking point in Britain). Some countries or territories have exemptions from certain laws, but overall, being an EU member means agreeing to follow a set of rules set out by the collaborative union government in Brussels. The idea is that Europe can do better economically, and better guarantee basic rights and standards of living, if all the countries work together as one. Needless to say, not everyone in Europe agrees this is a good thing (or that it works), and that's how Britain has ended up headed for the exit. But at the same time, many other countries are still scrambling to join. The European Union currently has 28 member countries. The UK is still a member for now, but is expected to leave in about two years. *The Republic of Cyprus holds EU membership on behalf of both southern and northern Cyprus, though the north is controlled by the unrecognized breakaway Turkish Republic of Northern Cyprus, where EU law is considered to be "suspended" until the dispute can be resolved. Two British military bases on Cyprus's southern coast, Akrotiri and Dhekelia, are considered territories of the UK and are not part of the EU. Incidentally, it is arguable whether the whole island of Cyprus is even located in Europe, but it was allowed in on the basis of its shared cultural history (78% of the population is ethnically Greek). **In June 2016, the UK voted to exit the EU. Though the country has already been excluded from some high-level EU meetings, it has not yet begun the legal process of leaving. Once it does, there will likely be around two years of exit negotiations before it fully separates itself from the union. Which Countries are in Line to Join the EU? 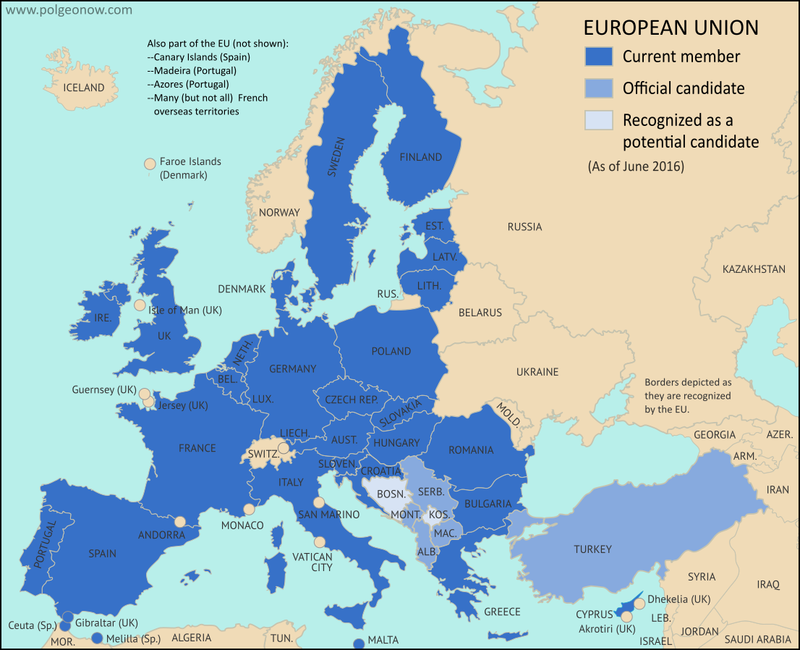 European Union membership is open any "European" country (a fuzzily-defined concept) that can convince existing members it will meet the standards of EU membership. These include being free and democratic, respecting human rights, and having a "functioning market economy" (basically anything except total economic chaos or communism). New members also have to adopt all the EU's laws before joining, prepare to efficiently implement new EU laws made after joining, and have the "capacity to cope" with having their economies basically merged with all the other member countries. Normally, they're also required to plan on adopting the euro as their currency, but not right away after joining. Joining the EU requires years of negotiation with the existing member countries, and the EU has a list of official candidate countries that are working on it now. Turkey applied all the way back in 1987, but is still struggling to get approval from the existing EU members. The other candidate countries are mostly at early stages of membership negotiations, or haven't even formally started yet. What Other European Countries Aren't in the EU? So which countries are left, that aren't in the European Union and aren't even applying for membership? There are actually quite a few. Some may hope to apply further in the future, while others have decided not to apply at all. There are some cases where it's not clear if a country is in Europe or not. The countries of the Transcaucasia region are sometimes considered culturally European, and sit right along the most commonly-used line between the European and Asian continents (following the divide of the Caucasus Mountains). Meanwhile, Kazakhstan is rarely treated as European, but part of it also lies on the European side of the line (here following the Ural River). These lists exclude several unrecognized or partially recognized breakaway states that the European Union doesn't even consider to be countries: Northern Cyprus, Transnistria, Abkhazia, South Ossetia, Nagorno-Karabakh, the Donetsk People's Republic, and the Lugansk People's Republic. The disputed Republic of Kosovo, claimed by Serbia and only recognized by 56% of the world's countries, is generally acknowledge as a country by the EU, which is why it was allowed to become a "potential candidate" country. Who Will Join or Leave Next? The future is impossible to predict, but you can stay up to date on European Union membership by checking back frequently with Political Geography Now, or by signing up for email updates from the box on the right-hand side of this page! You can also view all European Union articles, or follow PolGeoNow on Twitter for even more news and facts! Article by Evan Centanni. Country flags and associated HTML code from Wikipedia (licensed under CC BY-SA).